Blake and Mark take the show on the road the Wisconsin State Fair inside the Exposition Center at the Activity Stage for the annual Brew City Wrestling show. Before we get into the show itself, Mark sits down with Frankie DeFalco to discuss the lives of Nikolai Volkoff, Brain Christopher Lawler and Brickhouse Brown. 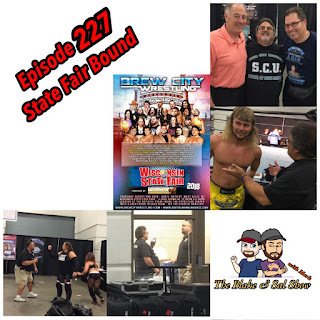 Then we goto the audio from Facebook Live where we discuss the show before, during and after the show, including meeting Greg Gagne, "Jumping" Jim Brunzell, Brian Pillman Jr. and Silas Young. It's a fun show so sit back and enjoy.